Hyperspectral imaging is an emerging technology with a very bright future. Multispectral imaging systems typically have a few spectral bands, sufficient to provide only qualitative information on a scene. Hyperspectral imagers, in contrast, can have many thousands of spectral channels, which allows for much more detailed analyses of the scene contents. Hyperspectral imagers have become more affordable in recent years as the price of detector arrays has dropped considerably in many spectral ranges. When a monochrome imaging array is coupled to a Fourier transfrom spectrometer it produces a spectral data cube having two spatial and one spectral dimension that can be analyzed in a variety of ways. Based on its expertise in Fourier transform spectrometers, Blue Sky Spectroscopy develops custom hyperspectral imagers at reasonable costs for various spectral ranges – from the visible to the far-infrared. In particular, we target hyperspectral imagers in the Terahertz range, which represents one of the last unexplored regions of the electromagnetic spectrum. The table below summarizes technical characteristics of some of the imaging spectrometers we can offer. The availability of suitable detector arrays is the basis for the development of imaging FTS systems. All system parameters can be tailored to the application in question. Terahertz: 0.1 – 3 THz ~1000 60 x 80 . Complementing the hardware development we provide software tools to effectively process, analyze, and manage the data volumes resulting from hyperspectral imaging. 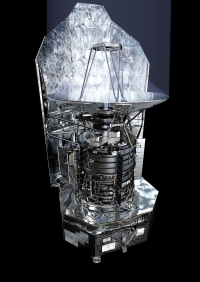 An example of our expertise in this area is the Data Processing and Science Analysis Software Centre for the SPIRE imaging FTS, an instrument on the European Space Agency’s Herschel mission, a far-infrared and submillimetre space observatory. Herschel is a cornerstone mission of the European Space Agency, successfully launched on May 14 2009. Its scientific payload includes three instruments, among them SPIRE, the Spectral and Photometric Imaging Receiver. SPIRE features a two-band imaging FTS for the wavelength ranges from 200 to 300μm and 300 to 670μm respectively, based on arrays of NTD spiderweb bolometers. The mission ended after the spacecraft exhausted its cryogen supply on April 29 2013. Blue Sky Spectroscopy develops and maintains the data processing software for the SPIRE imaging FTS under the technical authority of the Canadian Space Agency.